Fall Specials! Just in time for the Holidays! We’ve got some really terrific Fall specials to help you get ready for the holidays! Purchase any two syringes of Juvederm, Voluma, Restylane, Restylane Lyft, Restylane Silk or Sculptra and get a FREE facial or SkinMedica peel. If that wasn’t enough, there’s more. 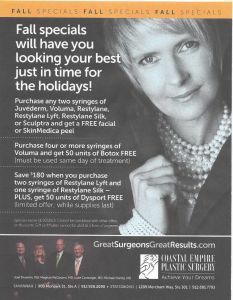 Purchase four or more syringes of Voluma and get 50 units of Botox FREE! And you can save $180 when you purchase two syringes of Restylane Lyft and one syringe of Restylane Silk. You also get 50 units of Dysport FREE! As with all good things, the specials will come to an end. Call our Savannah office at (912) 920-2090 or the Statesboro office at (912) 681-7793 and book your appointment by November 30 to reap the benefits of these fabulous offers! Offers expire November 30, 2015.